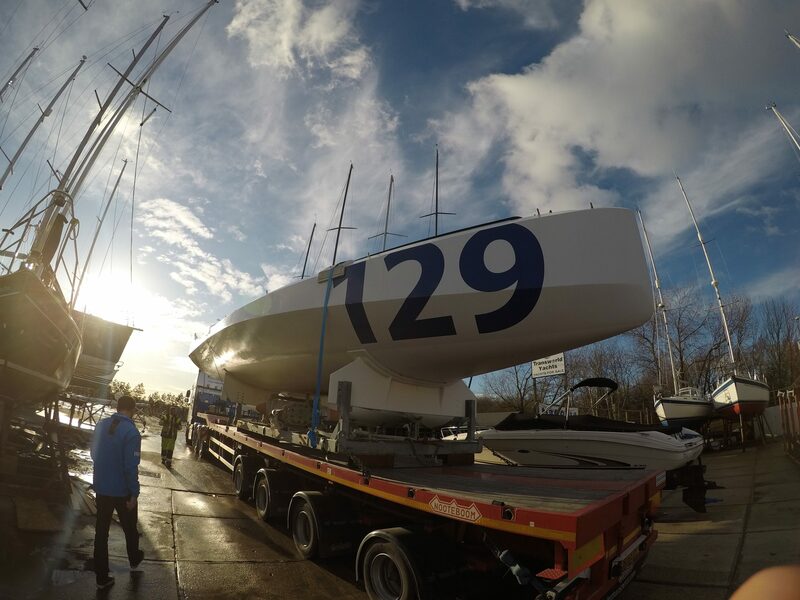 Concise 8 – our 3rd generation Class 40, has shown blistering speed from the word go, but after a structural failure in the last RORC Round Ireland race has some serious unfinished business! She returns revamped, revitalised, and ready to fight amongst the best. Jack Trigger will take the reigns for the 2018 season, in order to compete in both the Class 40 and RORC season championships, all in build up for the iconic Route du Rhum in November. The Route du Rhum is a famous french race, taking the best solo ocean racers in the world across the Atlantic in their purpose built racing machines, from St Malo, France to Guadeloupe in the Caribbean. Having returned to the UK in December after a new keel structure was fitted to the boat in China during 2017, Concise 8 has now undergone a comprehensive overhaul of all systems as well as a few minor modifications in order to prepare her for the season ahead. These modifications include a full electronic overhaul; changes to the keel structure mean that 90% of the old electronics have been removed, so it was the ideal opportunity to review the system and make a few sensible upgrades, including a modern digital switching system and simplified instrument wiring. ‘Alongside performance, reliability is a very important factor to consider when designing systems for these boats, especially so with the aim of competing solo, so any chance to simplify and improve is very important to us. At the end of the day we want to focus on performance, but we also have safety at the forefront of our approach.’ Along this same philosophy Concise 8’s cockpit has also had a small redesign. The focus here has been added protection for the driver and reducing both friction and weight around the sheet and runner leads. 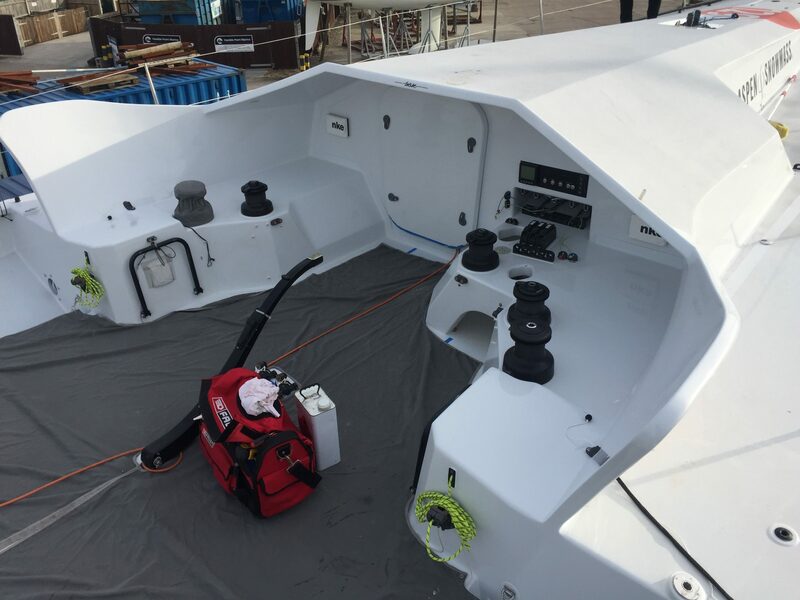 To achieve this we have extended the cockpit sides vertically and reduced the number of entries into the side of the cockpit – this is now a common feature on many of the latest design Class 40’s and IMOCA 60s. ‘We were one of the first teams to use the revolutionary ‘constrictor’ rope jamming system back in 2013, which has now been widely adopted by the racing world as a lighter, stronger and cheaper solution than a conventional clutch. Having thoroughly tested this system and built a level of confidence in its abilities, we are now using it in more areas across the boat than ever before. This is just one small example of how we are constantly learning, and looking for any way in which we can improve the performance of the boat.’ Last but not least, Concise 8 will be receiving a new mast for the 2018 season after discovering unexpected issues with the original Southern Spars tube. Axxon Composites are Class leaders in the field and have a fierce reputation in the fleet. They will provide us with a new mast that is lighter, simpler, and more robust, keeping Concise 8 at the front of the fleet in terms of speed and technology. The season ahead is busy and the fleet looking strong as ever and incredibly competitive. With renewed confidence in our machine, the focus now will be getting on the water as soon as possible and putting in some serious miles, before we line up against the fleet at the end of May in the gruelling Normandy Channel Race. Stay tuned for more updates in the next few weeks about our exciting calendar, and as we get back out on the water for a big year! Royal Ocean Racing Club champions! Normandy Channel Race – live updates! Follow Jack Trigger as he competes for the 2018 Route du Rhum in Class40.